Intel Ethernet + LANGuard + GameFirst III â€“ Game networking taken to the next level. ROG gives you more â€“ A ready-made gamer's toolkit. Air or liquid â€” it's cooler with copper! All-new CrossChill Copper is engineered with a copper cooling channel that's incredibly effective at removing heat. It's great on air, and with liquid you'll lower MOSFET temperatures by up to 23ËšC! 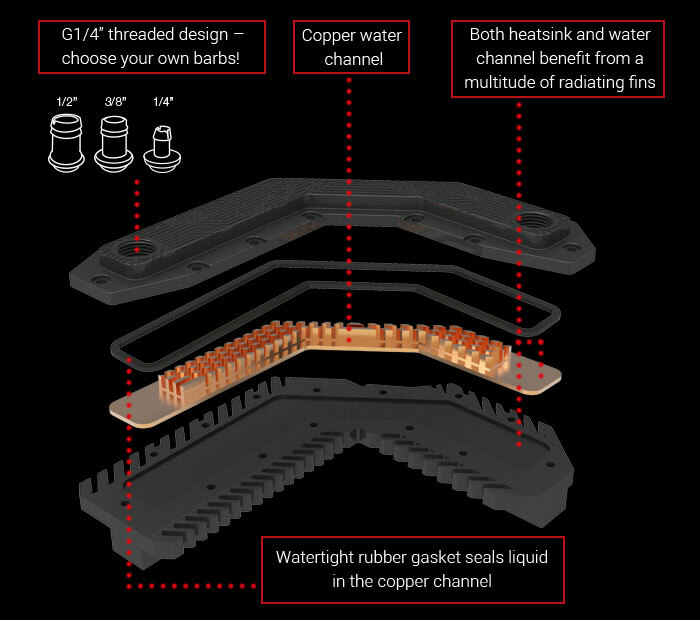 The G1/4" threaded fittings mean CrossChill Copper is ready for your existing cooling setup! 120dB SNR audio for gaming punch and Hi-Fi excellence! SupremeFX Formula 2014 delivers audio that's as great as a dedicated sound card! Cutting-edge electromagnetic interference (EMI) isolation and exceptionally-premium components deliver best-in-class 120dB signal-to-noise ratio (SNR) output. Exclusive SenseAmp technology automatically detects headphone impedance and adjusts accordingly, and SupremeFX Formula 2014 is able to drive up to 600ohm headphones. Moreover, Sonic SoundStage applies the best audio settings for popular game genres. Maximus VII Formula's mPCIe Combo III + 802.11ac / Bluetooth 4.0 module delivers the latest connectivity, with mini PCI Express (mPCIe) on one side and M.2 (PCIe/10Gbit/s and SATA/6Gbit/s) on the other. Style, Strength, and Cooling in One. More throughput, less CPU usage and great gaming experiences! Maximus VII Formula features the very latest Intel® Ethernet for faster, smoother gaming â€” always. Intel's LAN has the serious double advantage of reducing CPU overhead and offering exceptionally high TCP and UDP throughput. This significantly reduces the processor's workload, so there's more power for your game and your gameplay! More links for "Maximus VII Formula Intel Z97 (Socket 1150) DDR3 ATX Motherboard"
Got this Motherboard from OCUK as a replacement for a similar purchase with another retailer which went badly wrong as the previous board had a fault. Th OCUK supplied board has been absolutely perfect out of the box however and I am very happy with it. The board comfortably supports my SLI setup and my sound card as unlike previous Asus boards I have had it doesn't disable any of the PCI slots as a consequence of having additional GPU's inserted. It seems to support a very stable mild overclock on my Intel i7 4770K and my RAM. The BIOS settings are pretty comprehensive and easy to get the hang of. My few criticisms of it are that it is a bit short on internal USB 2.0 headers. I have my H100i CPU heat sink plugged into the one and only USB 2.0 header on the motherboard so I can't connect my USB 2.0 slots on the front of my case. However it has support for 2X USB 3.0 slots on the case so I don't really miss the USB 2.0 ports very much. Also there are only 6 USB ports on the back of the motherboard which I filled up with my various devices. It could do with either a couple of USB 2.0 ports to bulk out the numbers of perhaps a few more USB 3.0 ports. It has a lot of SATA 6GB connections but only 4 are supported by the Z97 chipset the rest are Asmedia supported, also if you use the SATA express sockets it disables some of the other SATA sockets. I would have preferred maybe 6 Z97 supported SATA sockets so I could get all my hard drives in them rather than needing to use the Asmedia sockets but its not a deal breaker. In all I would say this is an excellent motherboard would solid support for multiple devices and built to the usual high standard of Asus products. I can recommend it. I love this motherboard! I like the shrouded, black look. It was easy to install, it supports my pair of GTX980 graphics cards and the water cooling of the VRMs works well with no leaks and good comfortable temperatures. Overclocking is a really simple process. I love all the extras, like the wi-fi and Bluetooth connections. They make this board with the price premium.